A Trial Balance is a list of all the General ledger accounts (both revenue and capital) contained in the ledger of a business. This list will contain the name of the nominal ledger account and the value of that nominal ledger account. The value of the nominal ledger will hold either a debit balance value or a credit balance value. The debit balance values will be listed in the debit column of the trial balance and the credit value balance will be listed in the credit column. The profit and loss statement and balance sheet and other financial reports can then be produced using the ledger accounts listed on the trial balance. The name comes from the purpose of a trial balance which is to prove that the value of all the debit value balances equal the total of all the credit value balances. Trialing, by listing every nominal ledger balance, ensures accurate reporting of the nominal ledgers for use in financial reporting of a business’s performance. If the total of the debit column does not equal the total value of the credit column then this would show that there is an error in the nominal ledger accounts. 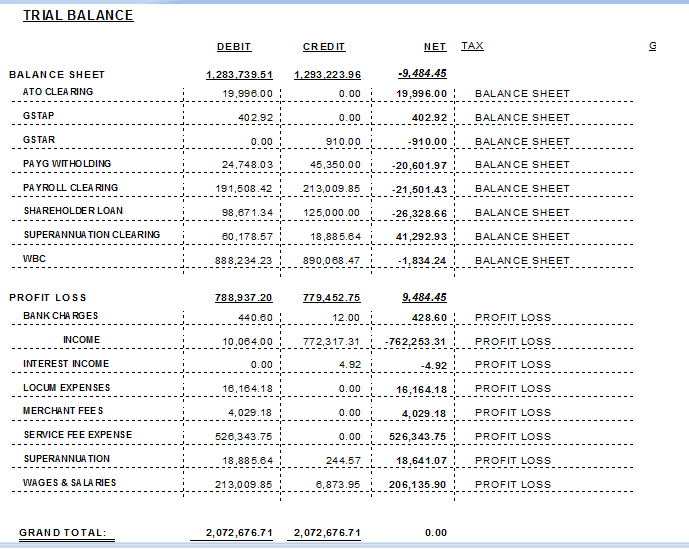 This error must be found before a profit and loss statement and balance sheet can be produced. The trial balance is usually prepared by a bookkeeper or accountant who has used daybooks to record financial transactions and then post them to the nominal ledgers and personal ledger accounts. The trial balance is a part of the double-entry bookkeeping system and uses the classic ‘T’ account format for presenting values. We use SQL technology to convert the CSV files into a Trial Balance (screenshot right).